A crunch of peanut in smooth dark chocolate. It's UNREAL how delicious these Dark Chocolate Peanut Gems are! Move out of the way, Peanut M&M'S®! 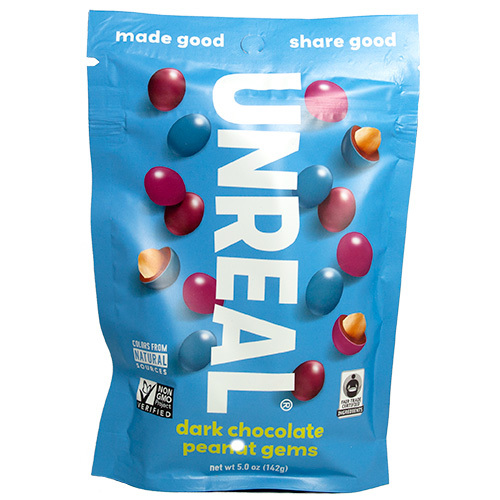 Unreal Dark Chocolate Peanut Gems bring the good back to America's favorite chocolate snacks, making them better for everybody with way less sugar (41%+ less! ), nothing artificial, Non-GMO Project Verified, Fair Trade Certified, eco-friendly and sustainably sourced ingredients. Dark Chocolate Peanut Gems are made with 72% cocoa and are naturally colored with purple cabbage, carrots, turmeric and beets. Plus, they're Certified Vegan! This is definitely a new favorite to feel good about! Ingredients: INGREDIENTS: dark chocolate (chocolate liquor*, sugar*, cocoa butter*, vanilla), roasted peanuts (peanuts, peanut oil), organic cane sugar*, rice starch, colored with (beet juice, spirulina extract), organic tapioca syrup, gum acacia, carnauba wax, tapioca starch. Conains peanuts. Made in a facility that handles milk, peanuts, soy, tree nuts, wheat. *Fair Trade Certified by Fair Trade USA. 68% Fair Trade Certified Ingredients. From the package: Contains Peanuts. Made in a facility that handles tree nuts, milk, soy, wheat. Each 5 oz bag contains about 58 gems and is 1.25" x 5.25" x 7.5".